Uttarey : Situated in the west district of Sikkim, you can reach Uttarey from Pelling, Gezing or Dentum. On your way you will pass Singsor bridge, said to be the second highest bridge in Asia. The height of Uttarey is about 6600ft. Uttarey is famous for its tranquility and natural beauty. The place provides beautiful view to the Himalayan mountains and is yet relatively less traveled by tourists. This allows a more serene atmosphere to be enjoyed. During winter the mountains around here are covered with snow allowing heavenly views. The Kagju Gumpha (Gumpha is the local for monastery) in Uttarey is a highly revered place of worship for the locals and a good place for sight seeing. The monastery is set amidst dense forests. The wall paintings in the monastery might be of interest to you. The Dentam peak and the river is also visible from the monastery. Other important tourist spots around Uttarey include the Mainbus Waterfall and the Chewyabhang Pass. This pass is about 10 km of Uttara and is the gateway to Nepal. 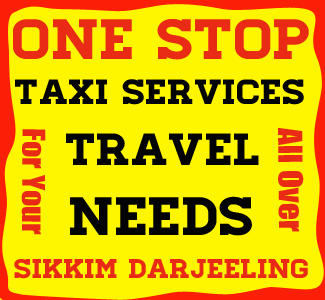 Tourists can reach Uttarey easily from NJP Rail Station or Bagdogra Airport or Siliguri Town or Darjeeling or Gangtok. Tourist Visiting Uttarey are suggested to stay for minimum 2 nights. First day - tourist can reach Uttarey from any source. Second day - full day sightseeing of Uttarey. Third day - Back to their next destination. NJP to Uttarey : 161 kms. Bagdogra to Uttarey : 164 kms. Darjeeling to Uttarey : 97 kms. Due to its advantageous location, many hotels and lodges have come up in and around Uttarey catering to varied tastes and budgets. Indian : Indian tourists visiting Uttarey do not require permit to visit. Best time to visit Uttarey is during the 12 months in the year. Most of the roads remains closed during the month of July, August due to heavy rainfall and landslides.